The robust 7.5% growth in global steel production strengthened the upstream demand for ferro alloys by 7% in 2007-08 and China recorded the highest demand for ferro alloys, followed by India and Russia. India, with a 5-7% share of the global ferro alloys industry, is among the10 largest producers of the material in the world. 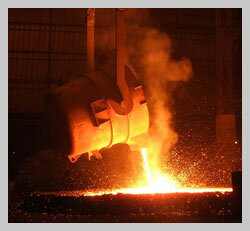 In India, majority of the ferro alloys furnances are largely located in Orissa, Andhra Pradesh, West Bengal, Chattisgarh and Goa due to proximity to mines. Most ferro alloy companies manufacture manganese or chrome alloys. Indian bulk ferro alloys supply constitutes of Ferro Chrome about 32%, Ferro Manganese and Silicon Manganese about 62% and rest others. India enjoys a natural advantage as it has the fifth-largest in chrome ore with a 100 million tones estimated reserve and the sixth-largest in manganese ore with an estimated 176 million tones reserve.